E-mu Systems Inc. 4060 Keyboard 1/2-page advertisement from page 23 in Contemporary Keyboard September 1980. Look at this! 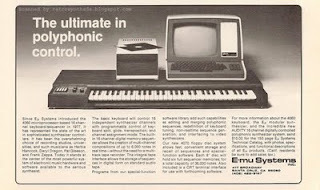 I believe this is E-mu's first ad ever to appear in Contemporary Keyboard magazine. And it is packed full with great historical reference information. It doesn't just mention historical info about the 4060 (along with a healthy dose of name-dropping), but also mentions the "new" 4070 Floppy Disc System, the E-mu Modular, and "the incredible new AUDITY 16 channel digitally controlled polyphonic synthesizer system". Excellent! As mentioned in the ad, the 4060 Keyboard has been around since 1977, and using my supa Internetz snoopin' abilities, I've pieced together a lot of the history that led up to this advertisement - and beyond. "This all changed with the release of the Zilog Z80 processor in July 1976. This chip was suitable for use in a synthesizer, and Scott was able to persuade Zilog to give him a development system, which meant Emu could at last join the microprocessor revolution. It wasn't long before Scott and Dave were expert software programmers, and the Z80 became the basis for Emu products for the next 10 years. 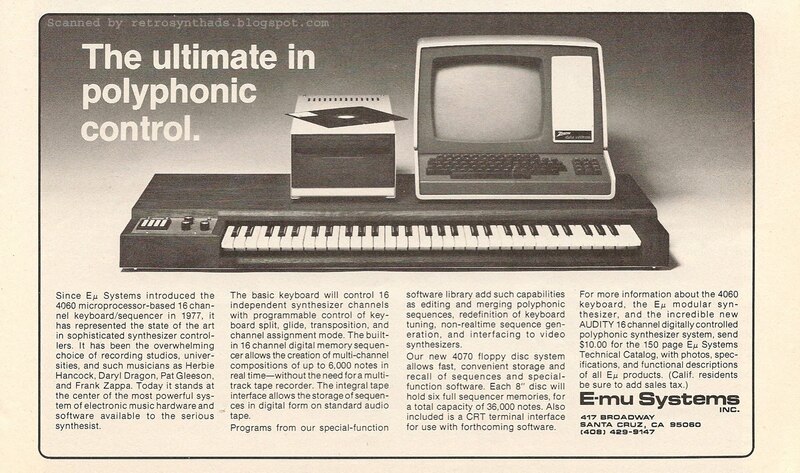 Emu first applied the new technology to keyboard and sequencer design with the 4060 Polyphonic Keyboard and Sequencer of March 1977, which cost US$3000. The new keyboard had 16 channels of polyphonic voice control, and the standard Emu keyboard controls plus a 16-button keypad. It also offered a real-time digital sequencer with 48kB of volatile memory, which held 6000 notes — groundbreaking at the time." The earliest introductory mention of the new 4060 keyboard that I found in my collection of old mags was from the March/April 1977 issue of Synapse magazine in the 'What's Happening" section (mistakenly referred to as the 460) . "E-mu announces the release of the 460 Microprocessor Keyboard. A five octave keyboard programs the sixteen voice polyphonic system. Programmable parameters include pitch, duration and keyboard glide. The entire system is controlled by a calculator type keyboard..."
Once launched, the 4060 continued to be promoted as part of E-mu's modular system that had already been around for years, turning up along side the modular in the 1977 Modular brochure (PDF from the Emulator Archive Web site) auctions, and other online and offline photos. "The advantage of this E-mu keyboard/sequencer is in having the capability of 16 independent voices, provided of course that one also has the 16 VCO's, VCA's, and envelopes. The fully developed system ($4110) with all the necessary extra memory modules (CMOS516K) ram boards with battery back-up. The keyboard above is $2500 and stores 60 key depressions) is capable of storing 6,000 key depressions." The review gives readers a great introductory tutorial on how to record, store, and recall sequences, and ends with some information on its compatibility with other manufacturers gear. "The E-my keyboard is available separately to be interfaced with other brands of synthesizers, though the manufacturer points out that casing for an E-mu power supply and output panel are necessary. They also express an order of preference for interface, that being: Oberheim (to whom they license some of their keyboard technology), Moog modular 921 VCO's, ARP 2600, and Minimoog... They point out, however, that the keyboard is compatible with any quality 1 volt/octave synthesizer."